Measures approximately 3.75″ diameter x 1.875″ tall. 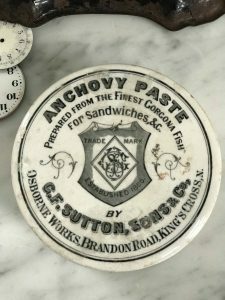 This is a listing for one (1) RARE G.F. Sutton, Sons & Co., Anchovy Paste. 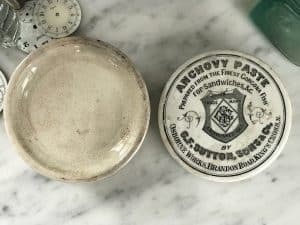 Prepared from the Finest Gorgona Fish for Sandwiches, & c. Osborne Works, Brandon Road, King’s Cross, N. Great Rare addition to your Antique English Advertising Pot collection. This ancient pot was curated during my travels to England’s Famous Antique Markets while visiting my daughter and her family in London. Please consider the images as the best part of my description. This rare pot has beautiful dark transfer with with a shield trade mark to its center. Both the lid and base are in good condition. Displays well. 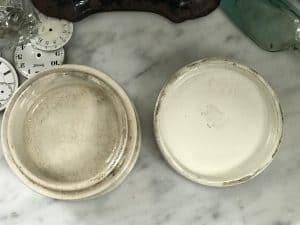 Most pots have some level of crazing, may have spots of discoloration, light hairline cracks and minor chips and fleabites that should be considered additions to character and do not detract from its display value. These are expected due to age, use and let’s not forget they were often buried for decades before being dug up and rescued. 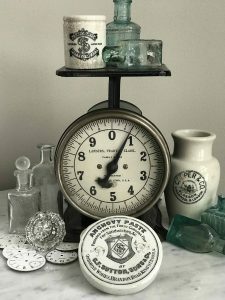 SKU: 4957 Categories: Antique English Advertising Pots, Lidded Pot, RARE Tags: Advertising Crock, Anchovy Paste, Antique English Advertising Pot, G.F. Sutton, Ironstone, Lidded Pot with Base, Sons & Co.